In the last months of 1944, in liberated Lublin, the Bureau for Design and Study of the Ministry of Communication, Post and Telegraph was established. The chief of the construction bureau was Tadeusz Sołtyk. In a few weeks time, the design of a simple, cheap and easy in production aeroplane was carried out. It was planned, that the Szpak 1 (Blackbird) will be a wooden, low wing monoplane, with a fabric covered fuselage. 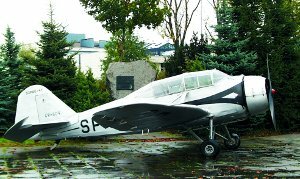 In February 1945, at the Experimental Aeronautical Workshop, the Szpak 2 was designed. The official, first test flight took place on 10th November 1945. The consecutive, Szpak 3 version arrived the next year. In 1947, the Ministry of Communication issued an order at the LWD for an executive and tourist four seat of mixed construction. In the assumptions of the ministry, only some improvements of the already existing Szpak 2 had to be done. The LWD works carried out the work of the Szpak 4A in a two seat configuration. It differed from its predecessor mainly in the fuselage construction. The aircraft was flown on 28th May 1947. Based on this aircraft, the tourist, Szpak 4T four seat version was designed. Its production was undertaken at the WSK Mielec. 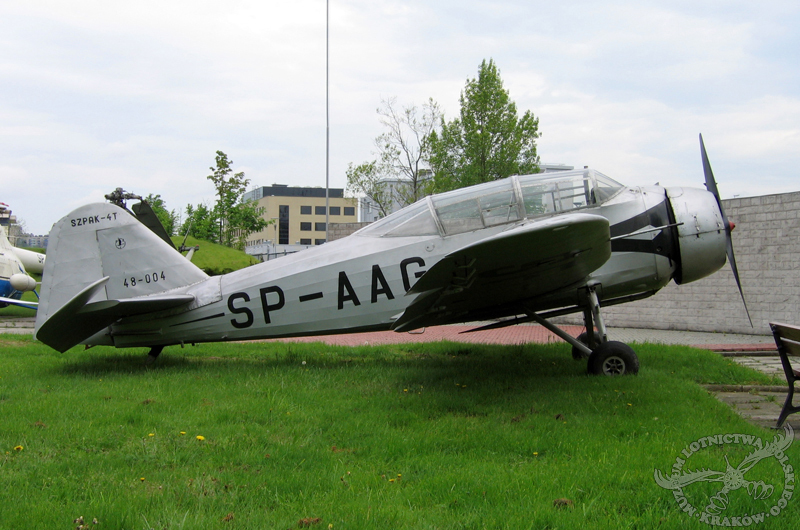 The first serially built, SP-AAF Szpak 4T was flown on 5th January 1948 and was next was exhibited at the Poznań International Fair. It took also part at the Mokotowski airfield air show in Warsaw. In total, 10 Szpak 4T aircraft were produced. They were the first mass produced post war aircraft in Poland. All the aircraft were handed over to aeroclubs, where they remained in service until 1952. Two examples were shortly used by the headquarters of the general organisation: "Service to Poland". The aircraft on display, the 48-004 (SP-AAG) Szpak 4T was displayed many times at air shows and by the end of 1963, was given to the museum.